Open letter to Irina Bokova, Director General UNESCO, Paris. I attended a scientific conference - on climate change, above all - at UNESCO in July. I was very surprised that UNESCO does not have an up to date recycling policy, nor any infrastructure to separate recyclable waste and have it processed/disposed of. I could not find any bins to separate plastics, metal waste or clearly marked paper-only bins. And that in the midst of a "Greening the Blue" campaign within the UN (http://www.greeningtheblue.org/ ), and good common sense and practice for all citizens, leave along UN staff. "use your own bags to collect bottles, cans, wrappers, etc. Then carry them home for recycling in the designated yellow or white bins"
This might have been ok in the 60's, but, dear Ms Bokova, we are 2015, where any UN organization should show the lead in environmental protection, recycling and green-living awareness. Especially UNESCO. I am very much looking forward to your answer on this, which will be published. "Limiting climate change requires a change of deep-rooted behaviours and a collective effort involving every individual. UNESCO promotes sustainability and is examining critically its greenhouse gas emissions so as to reduce the Organisation's carbon footprint." As far as I am concerned: one needs to put his/her money where his/her mouth is. And UNESCO does not. Much bla-bla but no boum-boum, where UNESCO should lead by example. 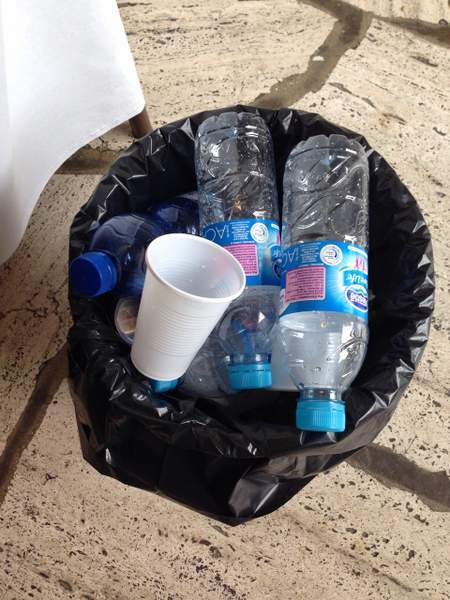 Picture: A general waste bin at UNESCO headquarters in Paris (July 2015)... No recycling nor separating recycable wasts... In the year "2015-2015", as the song goes.